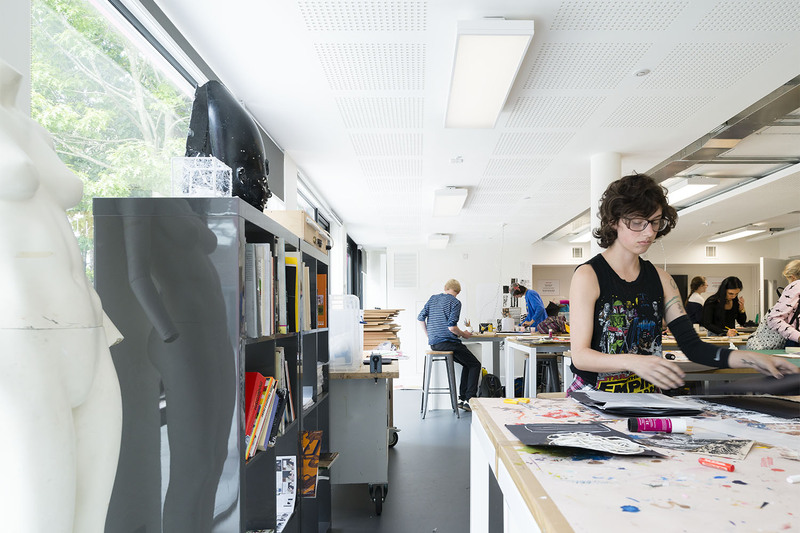 A transformation of the two former on-campus halls of residence into modern studio and teaching spaces. The success of the institution, and the wider changing demands of higher education, instigated a reappraisal of the Halls’ use as part of Design Engine’s 2009 vision for the future masterplan for the University. 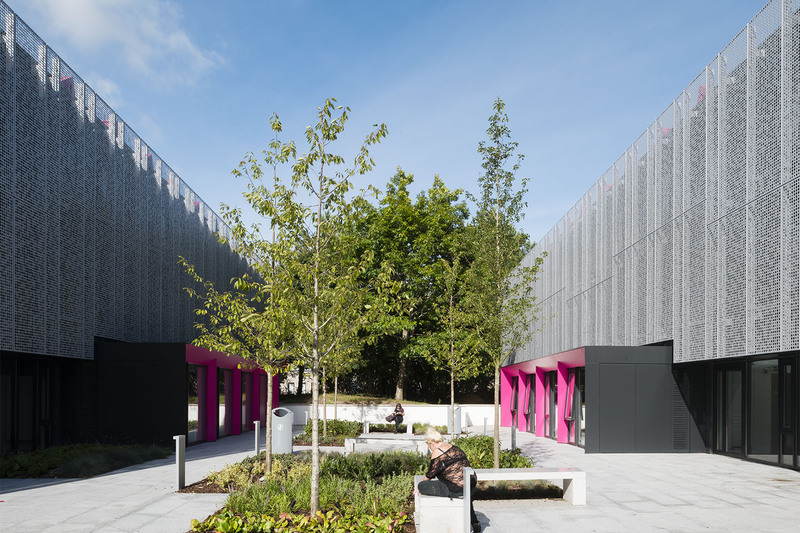 The outline brief was to facilitate the wider transformation of the campus with the re-use of buildings whose original function had become redundant, but whose structure and envelope remained largely sound. 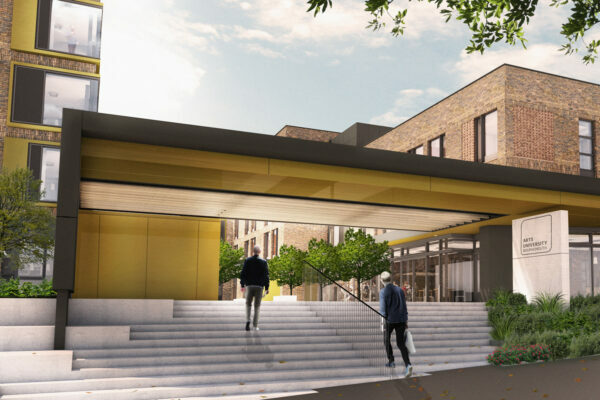 Collaboratively, the design team undertook a programme analysis that demonstrated how through the retention of the existing buildings the University could both achieve delivery of new teaching space each year, and at significant saving against that of a new building. 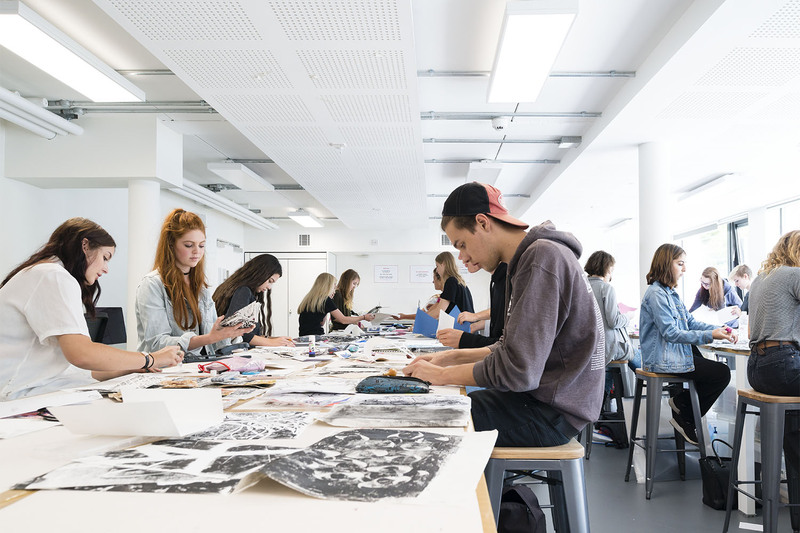 The university’s Model-Making, Performance Make-Up and preparation for Higher Education departments were identified as having commonality in their specialised and technical requirements, and by sharing facilities could reduce unnecessary duplication. Design Engine led a series of stakeholder design forums, helping formulate a brief for their needs within the constraints of working with an existing building. Heavyweight, highly-serviced mechanised modelling and prosthetic workshops are concentrated on the ground floor. This enables a structural strategy for a new steel frame to be inserted with the outer masonry skin, thus allowing the removal of cellular loadbearing partitions to create large open plan studios, which in turn facilitate the proposed natural ventilation strategies. A series of ground floor extensions for 3D printing spill out onto re-landscaped courtyards. These extensions act as shop windows advertising the output for the courses; fulfilling a desire to showcase work and continue the cross-fertilisation of ideas across the wider campus. 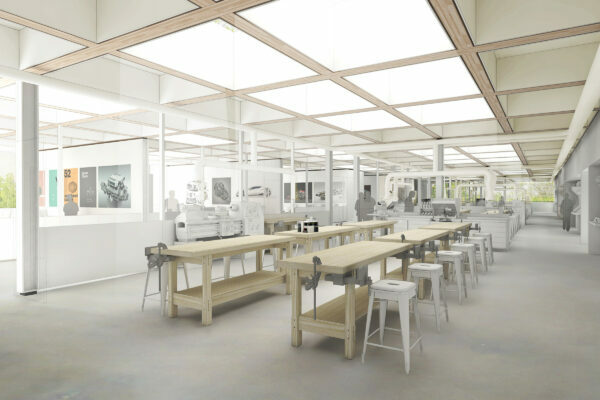 The buildings are capped by a series of saw-tooth north-facing roof lights atop a raised roof podium providing even natural daylighting to new drawing studios for for model-making, illustration and fashion design students. Clad in telemagenta pink, they point to a concept of feature surfaces and planes that highlight new interventions into the existing fabric. 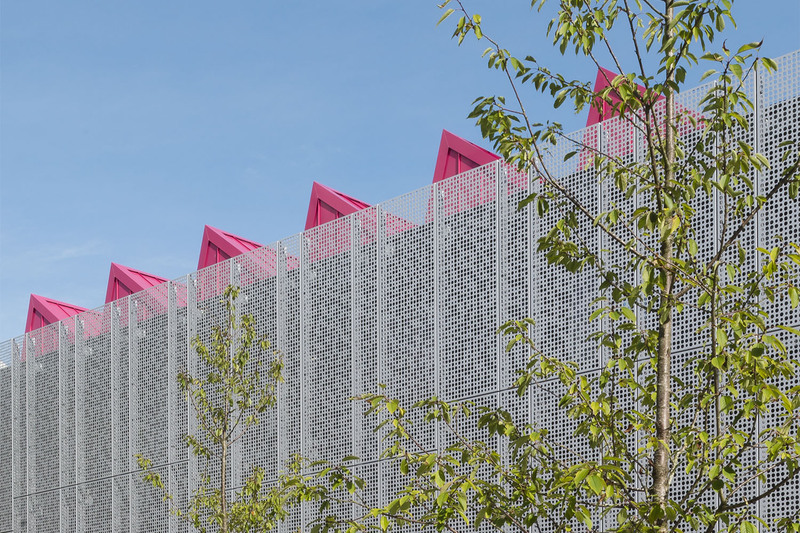 The transformation of the building is completed with a perforated aluminium veil over the existing building at first and second floor. A pattern of two sized circular apertures is formed into a randomised arrangment that extends across the upper façades. Working within the grids of both the former window arrangements and new steel structure, the 50% overall free area patterns allows continued venting whilst regulating excessive solar gain. 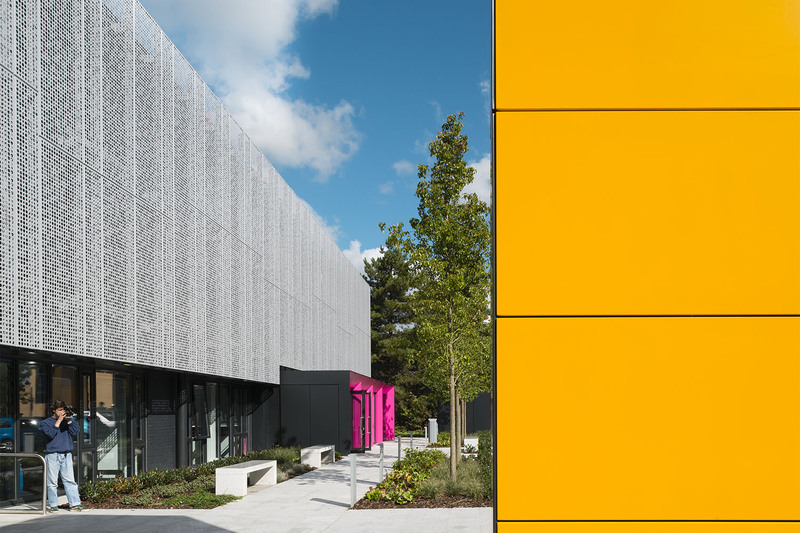 Delivered on programme, the project has been a huge success for the University, allowing it to build on the success of its oversubscribed creative courses and facilitating a wider strategic programme of campus renewal.